In this tutorial, I will show you how to change a slideshow viewing mode on iPad, from landscape mode to portrait mode, or from portrait view to landscape view. For some portrait photos, it will be better to view them in portrait view instead of landscape view, such as photos from a fashion show. 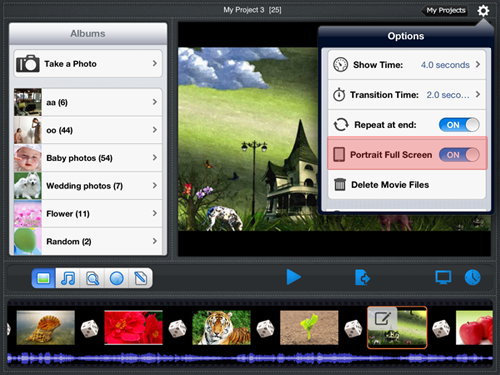 Photo Slideshow Director HD provides 2 viewing mode to present a photo slideshow: Portrait view and Landscape view. According to your photos type and your preference, you can play an iPad slideshow in landscape mode or portrait mode. To set the slideshow playing mode, you just need to change one setting – Portrait Full Screen. If you turn it on, the slideshow will play in portrait mode, otherwise, it will play in landscape mode. Tap the Gear setting icon in upper right corner, you will see Show Time, Transition Time, Repeat at end, Portrait Full Screen and other options. You can change the portrait and landscape by turning on / off Portrait Full Screen switch. Slide Portrait Full Screen ON / OFF switch to ON, you can view the slideshow in Portrait mode. Slide the switch to OFF, you can play the slideshow in landscape mode. You can follow the instructions to change the slideshow viewing mode on iPhone and iPod touch too. Photo Slideshow Director HD(Download it from App Store)is a professional photo slideshow maker for iPad, iPhone and iPod touch. You can use it to create wonderful slideshow with music and pictures on your iPad. It provides all effects to make a terrific slideshow for viewing and sharing your photos. With it, you can easily create a slideshow with photos from iPad albums, Picasa, Facebook, Flickr, Dropbox, SkyDrive and Instagram, then mirror the slideshow to HDTV from iPad, or upload it to Dropbox, Facebook, YouTube and SkyDrive for sharing and storing. This entry was posted in Best ipad slideshow app, iPhone Slideshow App and tagged change ipad slide show viewing mode, play slideshow in landscape mode on ipad, view slideshow in portrait mode on ipad iphone on June 7, 2013 by Sarah Jablich.